Everest Helicopter Tour is one of the incredible trips that take you to view of Mount Everest. This trip is suited to the people who do not have the time to go on trekking and climbing of Mt. Everest. It takes you as close to Mt. Everest and other gigantic Himalayan peaks of Everest region like Amadablam, Kantega, Nuptse, Lhotse, Pumori, and Khumbu Himal in a day. The Heli flight takes off from Kathmandu Airport in the morning about 7 am. The helicopter fly parallel to the Himalayan range revealing breathtaking landscape, valleys, mountain terrains, mountain villages, lakes, peaks, and glaciers. There will be a short stopover (10 minutes) at Kalapathar (5545m), the nearest best view point of Mt. Everest and its nearby peaks and also Khumbu glacier. In short time you should quickly snap the pictures of world’s highest mountain and its pristine landscape. Then it will fly to Syangboche and land there. You will enjoy breakfast at Everest View Hotel, the world’s highest hotel. Later, by 9:15 Am it will fly back to Kathmandu. Please do note that the stopover at Kala Patthar is subject to weather conditions. If bad weather prevails you may have to give up visit of Kala Patthar. In that case, you will stop at Shyangboche, the unpaved airstrip close to Namche Bazaar. Syangboche is also the drop-zone of Everest Skydive, the world’s highest Skydiving. Early morning you will be transferred to the Kathmandu airport. Board the Helicopter. At 7 AM it takes off Kathmandu airport. Short stopover at Kala Patthar (10 minutes). Then fly to Syangboche. Have breakfast in Everest View Hotel. Then by 9:15 fly back to Kathmandu. 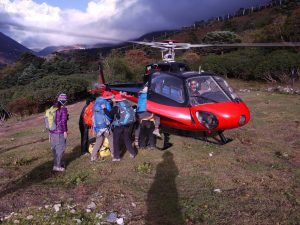 Excellent Himalaya Trek & Expedition offer competitive and reasonable price for Everest Helicopter Tour. It includes helicopter charter flight expenses from Kathmandu to Everest Base Camp and also returns to Kathmandu. The package cost will be different according to your group size (the number of persons you travel together) and the services you choose. For the price, you simply send us an inquiry with your group size. We hear back to you with accurate price including the list of services within 24 hours.